For other ships with the same name, see German submarine U-126. German submarine U-126 was a Type IXC U-boat of Nazi Germany's Kriegsmarine during World War II. In six patrols, she sank 25 ships for a total of 112,489 gross register tons (GRT). She was laid down at the DeSchiMAG AG Weser yard in Bremen as yard number 989 on 1 June 1940, launched on 31 December and commissioned on 22 March 1941 under Kapitänleutnant Ernst Bauer. German Type IXC submarines were slightly larger than the original Type IXBs. U-126 had a displacement of 1,120 tonnes (1,100 long tons) when at the surface and 1,232 tonnes (1,213 long tons) while submerged. 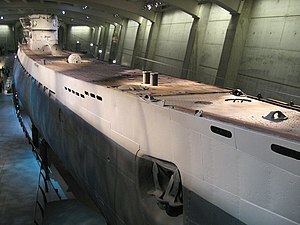 The U-boat had a total length of 76.76 m (251 ft 10 in), a pressure hull length of 58.75 m (192 ft 9 in), a beam of 6.76 m (22 ft 2 in), a height of 9.60 m (31 ft 6 in), and a draught of 4.70 m (15 ft 5 in). The submarine was powered by two MAN M 9 V 40/46 supercharged four-stroke, nine-cylinder diesel engines producing a total of 4,400 metric horsepower (3,240 kW; 4,340 shp) for use while surfaced, two Siemens-Schuckert 2 GU 345/34 double-acting electric motors producing a total of 1,000 metric horsepower (740 kW; 990 shp) for use while submerged. She had two shafts and two 1.92 m (6 ft) propellers. The boat was capable of operating at depths of up to 230 metres (750 ft). The submarine had a maximum surface speed of 18.3 knots (33.9 km/h; 21.1 mph) and a maximum submerged speed of 7.3 knots (13.5 km/h; 8.4 mph). When submerged, the boat could operate for 63 nautical miles (117 km; 72 mi) at 4 knots (7.4 km/h; 4.6 mph); when surfaced, she could travel 13,450 nautical miles (24,910 km; 15,480 mi) at 10 knots (19 km/h; 12 mph). U-126 was fitted with six 53.3 cm (21 in) torpedo tubes (four fitted at the bow and two at the stern), 22 torpedoes, one 10.5 cm (4.13 in) SK C/32 naval gun, 180 rounds, and a 3.7 cm (1.5 in) SK C/30 as well as a 2 cm (0.79 in) C/30 anti-aircraft gun. The boat had a complement of forty-eight. U-126 opened her account by damaging the British Canadian Star about 650 nmi (1,200 km; 750 mi) west of Lands End on 20 July 1941. She had missed with torpedoes and decided to use her guns instead, but accurate return fire from the merchantman (many merchant ships had some form of defensive armament fitted), drove her off before she could finish the job. A week later, things improved when she sank Erato on 27 July, west of northwest Spain. She used her deck gun again to sink the schooner Robert Max on 4 August east of the Azores. She sank the Yugoslavian Sud using the deck gun once more, but in conjunction with the Italian submarine Marconi on 14 August northeast of the Azores. The boat was rewarded with two sinkings on 10 October 1941 northeast of the Cape Verde islands; Nailsea Manor was carrying HMS LCT-102 as deck cargo when she was attacked. U-126 also sank Lehigh about 82 nmi (152 km; 94 mi) off Freetown, Sierra Leone, on the 19th and Peru on 13 November, southwest of Cape Palmas (Liberia). She assisted survivors from the German commerce raider Atlantis on the 22nd. The boat was also successful in early 1942 as part of Operation Drumbeat (Paukenschlag), the German assault on merchant shipping along the US coast. She sank many vessels, beginning with Gunny on 2 March about 200 nmi (370 km; 230 mi) south of the Bermudas and finished with Olga on the 12th. One ship that did not sink was Colabee. She was attacked on the 13th about 10 nmi (19 km; 12 mi) off Cape Guajaba, Cuba. The ship ran aground after being torpedoed and abandoned with her engines still running. She was salvaged, repaired and returned to service. There was drama after the sinking of the Norwegian tanker Høegh Giant on 3 June 1942 about 400 nmi (740 km; 460 mi) east of Guyana. The ship's master was questioned by the German sailors, but when he did not understand what was being said, the Germans fired over a lifeboat, wounding one man. Other vessels were attacked in the area of the Caribbean and the West Indies, using torpedoes and the deck gun. Patrol number five was the boat's longest - 111 days. The voyage took the submarine to west Africa. On 1 November 1942, she sank the Liberty ship George Thatcher about 100 nmi (190 km; 120 mi) from the coast at Gabon. She was also successful in sinking New Toronto on the 5th 24 nmi (44 km; 28 mi) from Kotonou; her cargo included 75 live cows. One of U-126's victims on this patrol was Flora MacDonald, which was torpedoed on 30 May 1943 south of Freetown in Sierra Leone. The ship did not sink, but after being beached and the cargo salvaged, she burned for 16 days and was subsequently declared a total loss. The U-boat also hit Standella on 2 June. The submarine was attacked by an aircraft (the source does not give the type), off Freetown on the 15th. The boat was sunk by a Vickers Wellington of No. 172 Squadron RAF, on 3 July 1943, off Cape Ortegal, Spain. There were no survivors from the 55 man crew. ^ a b Kemp 1999, p. 127. ^ a b Helgason, Guðmundur. "The Type IXC boat U-126". German U-boats of WWII - uboat.net. Retrieved 19 November 2012. ^ Gannon, Michael - Operation Drumbeat - the dramatic true story of Germany's first U-boat attacks along the American coast in World War II, 1990, Harper and Row publishers, ISBN 0-06-016155-8, p. 439. ^ Helgason, Guðmundur. "Høegh Giant: Norwegian Motor tanker". German U-boats of WWII - uboat.net. ^ Helgason, Guðmundur. "Ships hit by U-126". German U-boats of WWII - uboat.net. Retrieved 9 July 2012. Kemp, Paul (1999). Ships hit by U-Boats Destroyed - German Submarine Losses in the World Wars. London: Arms & Armour. ISBN 1-85409-515-3. Helgason, Guðmundur. "The Type IXC boat U-126". German U-boats of WWII - uboat.net. Retrieved 7 December 2014. Hofmann, Markus. "U 126". Deutsche U-Boote 1935-1945 - u-boot-archiv.de (in German). Retrieved 30 January 2015.